Jane Kramer started cooking when she started writing. Her first dish, a tinned-tuna curry, was assembled on a tiny stove in her graduate student apartment while she pondered her first writing assignment. From there, whether her travels took her to a tent settlement in the Sahara for an afternoon interview with an old Berber woman toiling over goat stew, or to the great Lon Jane Kramer started cooking when she started writing. Her first dish, a tinned-tuna curry, was assembled on a tiny stove in her graduate student apartment while she pondered her first writing assignment. From there, whether her travels took her to a tent settlement in the Sahara for an afternoon interview with an old Berber woman toiling over goat stew, or to the great London restaurateur and author Yotam Ottolenghi's Notting Hill apartment, where they assembled a buttered phylo-and-cheese tower called a mutabbaq, Jane always returned from the field with a new recipe, and usually, a friend. To ask other readers questions about The Reporter's Kitchen, please sign up. I'm not sure I'd read any of Jane Kramer's articles before reading this book but I love food memoirs and I figured someone who writes for the New Yorker was worth gambling on. It was an uneven reading experience. I greatly enjoyed her chef profiles, particularly the one on Yotam Ottolenghi, and I loved her essay contrasting the lack of storage in her NYC kitchen and the roomy spaciousness of her kitchen in Italy. I haven't spent much time considering kitchen storage but the essay really resonate I'm not sure I'd read any of Jane Kramer's articles before reading this book but I love food memoirs and I figured someone who writes for the New Yorker was worth gambling on. It was an uneven reading experience. I greatly enjoyed her chef profiles, particularly the one on Yotam Ottolenghi, and I loved her essay contrasting the lack of storage in her NYC kitchen and the roomy spaciousness of her kitchen in Italy. I haven't spent much time considering kitchen storage but the essay really resonated with me and made me think about the kitchen gadgets I rarely use but feel the need to hold on to. I wish all the essays had been so thoughtful but they often seemed crammed with esoteric recollections and copious name dropping and I wasn't always sure about Kramer's larger point or theme. I'm sure people who are familiar with Kramer's work will find much to admire, however. I decidedly did like the description of the book but I found her essays to be all over the face and confusing at times....sorry, not my cup of tea. This is part travelogue, part culinary bliss, part food anthropology and part name dropping. The longer essays had me looking ahead to see if I really wanted to spend more time on them. But much of it held my interest and was enjoyable. 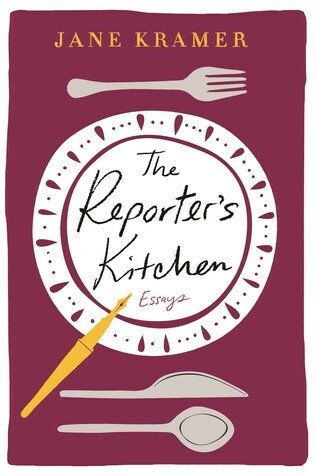 Essays from Jane Kramer's life as a writer and reporter, focused on food. They were interesting, but a lot of the food was way over my head, and it was definitely for an audience better educated in the high end of food, restaurants, and restaurant culture. I'd like to hang out in Jane's kitchen; this book is next best. I was annoyed by the second page. The author makes a joke about her daughter calling her "the Fürher" in the kitchen. Aren't we sophisticated showing that we can use umlauts? Well, the word is Führer, not Fürher! A simple Google search on Hitler would have pulled up about a million examples of the correct spelling. So I took a deep breath and went past it. And then started to feel hyper and manic as I was reading. I was baffled but then realized the author is zipping by and hopping past one subj I was annoyed by the second page. The author makes a joke about her daughter calling her "the Fürher" in the kitchen. Aren't we sophisticated showing that we can use umlauts? Well, the word is Führer, not Fürher! A simple Google search on Hitler would have pulled up about a million examples of the correct spelling. So I took a deep breath and went past it. And then started to feel hyper and manic as I was reading. I was baffled but then realized the author is zipping by and hopping past one subject to another, not only name-dropping but city-dropping all in the same breathless sentence, the majority of which are between 50 and 80 words. I know because I counted one out of curiosity and it came in at 78 words. A sentence, not a paragraph. Example: She's talking about the size of her kitchen and the spices in it in NY and then the next sentence is this. "The dinner I was cooking a few pages ago - the clam-and-pork stew with plenty of garlic and piri piri peppers that I first ate in a Portuguese fishermen's tavern near Salem, the day I tacked wrong and sailed my boyfriend's sixteen-footer into a very big ketch and broke his mast and, with it, whatever interest he had in me - is not the dinner I am cooking today, at a farmhouse in Umbria." See what I mean? Spices in NY, ketches in Salem, farmhouse in Umbria. Now I'm FROM Salem and cannot think of one Portuguese fishermen's tavern nearby. Maybe Gloucester, definitely not Marblehead and most definitely not Manchester-by-the-Sea. She might even mean Salem, VA or Salem, OR but I can't be bothered Googling to see if they even have water if she can't Google how to spell führer. See what I just did there? That is this book. Jane Kramer’s articles in the New Yorker have, over the years, provided a wide ranging and nuanced picture of European society and politics, with some unforgettable portraits in the process. And then there is her article in July of last year which is the best account ever of why I am so smitten with Bernie Gunther. So as soon as this book hit the stands, I ran to my nearest book store, brought it home, and devoured it. She is unique in the way she connects Jane Kramer’s articles in the New Yorker have, over the years, provided a wide ranging and nuanced picture of European society and politics, with some unforgettable portraits in the process. And then there is her article in July of last year which is the best account ever of why I am so smitten with Bernie Gunther. She is unique in the way she connects cooking and writing – each one enhancing and reinforcing the other. It is filled with happy memories, good friends and good food and really good writing – an irresistible combination. It is a book I will read again, more than once. I read a lot of culinary-related books. I didn't love this book, but I didn't hate it either. It reminded me somewhat of Ruth Reichl's books, of which I am a big fan. This book is a collection of Jane Kramer's previously-published articles from The New Yorker. Many were about her life in her home New York state, and her home in Umbria, Italy. She references a lot of the same people in her articles, particularly Yotam Ottolenghi, and to a lesser extent, Naomi Duguid. The article I enjoyed the most I read a lot of culinary-related books. I didn't love this book, but I didn't hate it either. It reminded me somewhat of Ruth Reichl's books, of which I am a big fan. The article I enjoyed the most, interestingly enough, was the one about foraging for wild food, "The Food at Our Feet." I would never trust myself to forage for my own food, so this was strangely fascinating to me. You know those books that, while browsing the shelves of a library or book store, you see and know immediately, before even opening the front cover, that you will love. There’s just something about the cover or the title that speaks to you. Possibly it’s because you recognize something of another book you’ve already read and learned to love hiding within its pages. This was one of those books. I was in my school’s library, browsing the new arrivals, a few other books already in hand, when I saw t You know those books that, while browsing the shelves of a library or book store, you see and know immediately, before even opening the front cover, that you will love. There’s just something about the cover or the title that speaks to you. Possibly it’s because you recognize something of another book you’ve already read and learned to love hiding within its pages. This was one of those books. I was in my school’s library, browsing the new arrivals, a few other books already in hand, when I saw this book. I took one look, grabbed it, and walked to the counter to check out. I didn’t regret that choice. This is a pretty wonderful book written by an extraordinary writer, notably in the New Yorker. However, my major caveat is that the reader had better be prepared for LOTS of detail about some important figures and cuisines of the culinary world, but otherwise obscure to us mere mortals who dine out and even prepare food, but without the quite obsessive zeal of Kramer. Reading about Jane Kramer's passion in the kitchen was a delight. Her essays - a collection of the occasional "breaks" she got from covering European politics for The New Yorker - teach and entertain ... and make you want to shop for an amazing meal at home. While some of the info was really interesting in terms of the history of food, different cultural connotations with food, etc., there were also times where I felt the author made inappropriate sexist comments or rude comments regarding certain individuals. This book is about the essence of the spirit and experiences that influence one to become a chef. If you enjoy the Mind of a Chef or Anthony Bourdain's gastromic adventures, you will enjoy this series of essays. The author's New Yorker columns beginning in 1964. Somewhat self-indulgent, but with the breadth of travel and experience, it's hard to begrudge the tone. Like Chef’s Table in book form. Before joining the magazine, Kramer was a staff writer for the Village Voice; her first book, “Off Washington Square,” is a collection of her articles from that paper. She has published two collections of essays from The New Yorker, “Allen Ginsberg in America,” (1969) and “Honor to Jane Kramer has been a staff writer at The New Yorker since 1964 and has written the Letter from Europe since 1981. Before joining the magazine, Kramer was a staff writer for the Village Voice; her first book, “Off Washington Square,” is a collection of her articles from that paper. She has published two collections of essays from The New Yorker, “Allen Ginsberg in America,” (1969) and “Honor to the Bride,” (1970), which was based on her experiences in Morocco in the late nineteen-sixties. Since 1970, most of Kramer’s work for the magazine has covered various aspects of European culture, politics, and social history. Many of these articles have been collected in three books: “Unsettling Europe,” (1980); “Europeans,” (1988), which won the Prix Européen de l’Essai “Charles Veillon” and was nominated for the National Book Critics Circle award for nonfiction; and “The Politics of Memory: Looking for Germany in the New Germany,” (1996). A notable exception to Kramer’s European reporting was her 1977 Profile of the pseudonymous Texan Henry Blanton. It was later published as a book, “The Last Cowboy,” (1977), which won the American Book Award for nonfiction. Parts of her book “Lone Patriot,” (2002), on the right-wing American militia leader John Pitner, also first appeared in the magazine. Her article on multiculturalism and political correctness, “Whose Art Is It?,” won the 1993 National Magazine Award for feature writing and was published as a book in 1994. Jane Kramer lives in Paris, New York, and Umbria, Italy.